From the looks of their logo and the name of their moniker defunct Australians Armoured Angel would have you believe they are some form of power metal or NWOBHM, especially since their operating heydays came in the late 80s-early 90s. By reissuing their Communion EP Hells Headbangers is going to try and dispel that notion, by also introducing the audience to what is believed to be one of the influential Australian extreme metal bands. Far from power metal, Armoured Angel instead provide a potent mix of mid-pace Bolt Thrower plod, without overt production density, slightly slowed down Sodom, while definitely not as nasty, plus a little bit of early Anthrax mischief. Armoured Angel is a primary example of an early death metal band which found the riff they liked and rode it mercilessly. Discovering their groove midway through Castration, they will not hesitate to milk the riff for all it is worth. But then, there is definitely a large breath of thrash in the EP. The close of Castration, the most of Tergiversator are full with maybe primitive, but definitely hooky, melodies, and there is why I draw my Sodom references. To close things off, My Fist Your Face is a completely unabashed thrash, and the song title could not have been more fitting. Being that the songs revolve around 1-2 riffs, Armoured Angel circa Communion feel like a prototype band, something that put song skeletons together, to build upon further down the road. At the same time, the band has put efforts in their soloing efforts, climbing the fret in Tergiversator, or drilling along the lines of the bumble bee flight in the title track. Soundwise, Communion is as basic as it gets, in accord with the riff strictures. Its high hat/cymbal rides, periodically appearing, are a little too high in the mix. To some they may be a slight distraction, but they provide a proverbial slap in the face, not letting the listener just nod off. 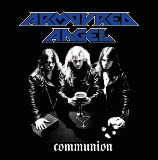 The melody of the title track may have an occult feel to it, giving a rise to a thought whose communion that might have been anyway that Armoured Angel attempted to describe, not to mention not so subtle cover art hint. This release is for the lovers of metal unadulterated, basic and from the heart.